So Hubspot have launched the conversation inbox. Great news at first as we use Frontapp and would love to come away and have all in Hubspot - however, there are two issues. 1. When receiving an email from Outlook, it double spaces the lines. 2. Hubspot auto creates a contact for anyone that emails in - or is cc'd into a reply. So for the likes of us who support our clients via email, we are going to be adding around 300-400 contacts a day of whom most of them are external companies. Plus all the spam emails are going to be added as contacts. In around 100 days, we will have an extra 40,000 contacts in the system that we do not want in the system and of course is far to time consuming to start going through each and deleteing. Additionally, Hubspot will invoice for all these extra contacts that we never gave permission for them to be auto added to our CRM and messing it up! C'mon Hubspot!! Surely you should be adding a "Create contact" button giving a user the option unless they alrerady exist. This is basic stuff and have no clue how such a big error has been made when releasing this? Totally unusable until added and in fact dangerous as can ruin your CRM with duff data!!!! I have reported this behavior to the Product Support team and they are currently investigaging. I'll keep you posted as I receive updates. Visitors are not / cannot added to your HubSpot contacts database automatically simply by starting a chat. They're still associated with an anonymous tracking cookie until you receive either an email address from them or manually add them as a contact. 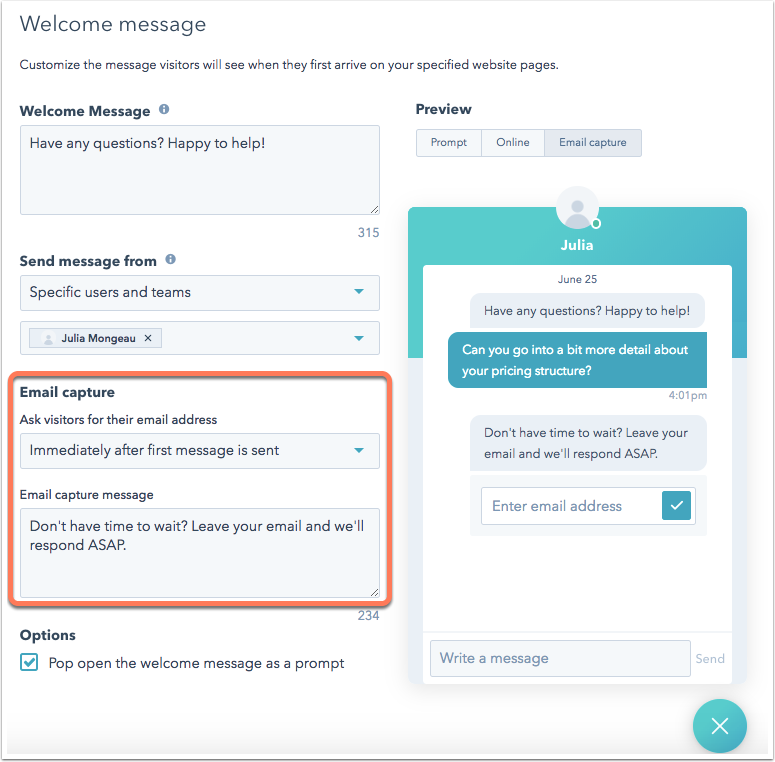 After initiating a conversation, the visitor will be prompted to enter an email address so that you can follow up via email if they close out of the chat widget before you can reply. In the bottom-left corner, click Inbox Settings > Chat. In your targeted messages settings, hover over the chat widget you want to customize the email capture message for and click Edit. Click Message on the left. Under Email capture, click the Ask visitors for their email address dropdown menu and select when you want the email capture message sent: Immediately after first message is sent or If no team member responds after 1 minute. Type your message in the Email capture message field and then click Save when you're done. Screenshot attached of the double spacing and also your colleague saw it on a screenshare. Re contact creation, total and utter madness and unusable!! How would you like an extra 40,000 contacts in your Hubspot in the next 100 days - who have little to do with any sales opps and then I bill you for the extra!! "Visitors are not / cannot added to your HubSpot contacts database automatically simply by starting a chat. " Firstly, I am referring to email NOT chat! Every single person who emails in the conversation inboix IS ADDED to Hubspot! I have even had your support staff admitting this. Back to my question and point is who would like an extra 40,000 emails added as contacts and then charged for them. It really think this hasn't been thought about and very happy to debate it! It's a BIG problem, I agree ! Specially with the RGPD law ! When a contact is in CC for an mail, we don't have any autorisation to collect and conserve them in to a CRM ! Not a clue why this has been marked as solved? If you use conversations for support, it automatically adds every email as a new contact. Who wants thousands of contacts added that may not be clients and then charged for them. Outrageous!!! and therefore renders this totally and utterlu useless? Please can someone respond and explain and this is very messed up logic! I agree, it does not seem that this issue is resolved at all ! This poster is correct and there is NO WAY that this is "resolved" in any way. This actually caused me to hit a billing threshold for contacts and have my bill increased because of the sheer amount of spam contacts we received when we attached our main company inbox to Conversations. I even had one company that changed their subdomain 20 times so that I not only had one but **20** bogus contacts for one spammer. Multiply this by the BILLIONS of spam emails that are sent per day and you get a nice EPS bump. This might be an excellent way to consolidate email for the whole team, but it's also an amazing way to increase margins for HubSpot at customers expense. I'm not being a troll or shrill. The "feature" should have been rolled back the minute that people started complaining about this due to the festering ill will it creates. Personally, I think that charging by the number of contacts in a database is assinine, but blatantly creating "features" that automatically make you pay more because of the bad behavior of others doesn't make it sit any better with me. The better way to handle this would be to allow manual adding of contacts from the view or to have another flag to mark a contact in such a way that they are not counted towards the contact quota. Automatically adding contacts in the year 2018 when the VAST majority of email sent is worthless seems to me to be, at best, a thoughtless gesture. It's a bad idea and needs to be fixed posthaste. 100% this is exactly my issue and I am struggling to get any clear responses. REMEMBER WE PAY HUBSPOT BY CONTACT NUMBERS - is this the reason for the secrecy around this huge problem? Can @roisinkirby or someone from Hubspot please reply here with a status update?? My emails are all in Front right now, and I'm not moving until this is fixed.